ZURICH – Initiatives that get implemented to combat food waste are sometimes influenced by and reflective of local gastronomic traditions. This is the case of Aess-Bar, a Swiss company that aims at raising awareness about food waste by means of commercialising unsold, fresh artisanal baked goods at a discount in its bakeries. It was founded by four friends in 2013 with the mission to find viable solutions to solving this problem. Following an initial phase of research, they discovered that, out of the two million tons of food being wasted annually throughout the entire food value chain, 45% occurs in households. So they came up with the idea to tackle food waste in the bakery sector where items such as bread – traditionally characteristic of the Swiss cuisine but also an important source of wheat waste – could educate customers about the real value of fresh foodstuffs, hoping that, as a result they would change their behaviour at home. “The way we do that is by actually selling bread, which usually you just keep one day, to show the people that is actually still valid, still high-quality, still very tasty and really good,” said co-founder Raoul Stoeckle. Last January I interviewed Raoul in Zurich, at their first ever bakery. It is located at the heart of the old town, just a hundred metres from the Limmat river up the cobbled Stuessihofstatt street. The diversity and originality of its local stores, cafes and art galleries, abundant in that maze of narrow streets, provide a sense of harmony, in which Aess-Bar´s role fits in perfectly. At first sight, their bakery looks no different than any other in the city: on its shelves one can find just about any type of bread, its fridge contains a wide variety of sweet and salty items, and coffees and teas are also on offer. 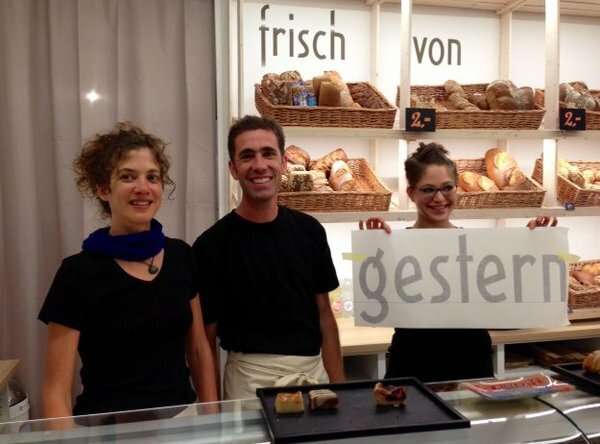 But painted on the facade, next to the logo, the slogan “frisch von gestern”, which means “fresh from yesterday”, gives the customers a hint of the kind of bakery this is. Raoul arrives hastily on his kick scooter as he is on a hectic schedule. From there we head to an adjacent fancy office room in a basement where we sit down to talk about Aess-Bar, their mission to build a self-sustaining company with a social/environmental purpose, food waste and consumer behaviour in Switzerland. Currently, Aess-Bar is well established in the market and continues to grow, thus proving the resilience and success of its business model. 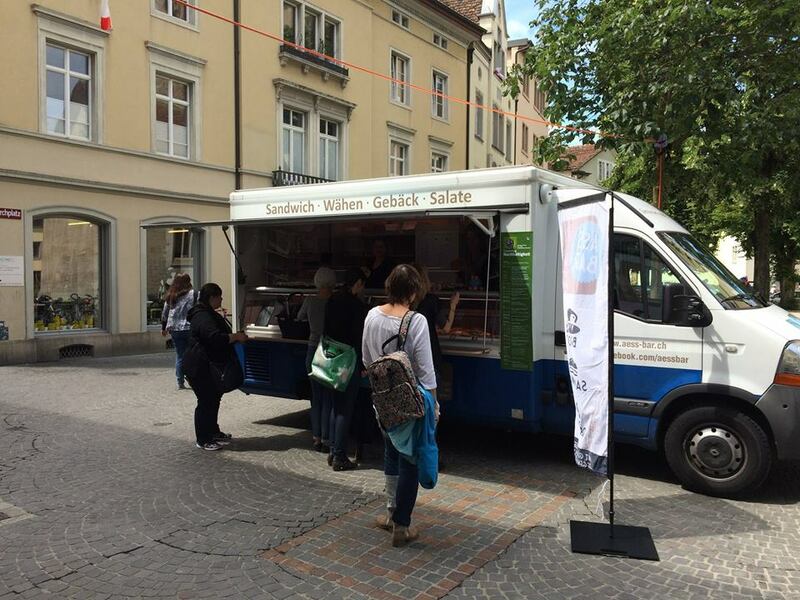 They have bakeries in the cities of Zurich, Bern, Winterthur, St. Gallen and Friburg, and two food trucks at the ETH University in Zurich. In 2016, they saved 250 tons of food from going to waste – equivalent to 225,000 kg. of CO2 – and sold tasty surplus baked products to 500,000 people. Also, last year, they received a positive media coverage, being featured in 200 media articles. 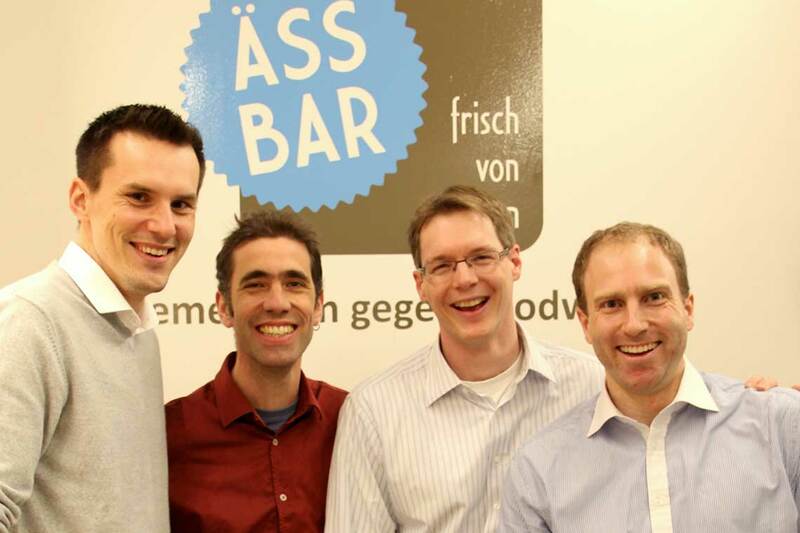 Co-founders of Aess-Bar pose for a picture. Source: Aess-Bar. What is Aess-Bar? What is its mission, goals? The goal of Aess-Bar is quite easy. We collect goods, baked goods, from bakeries that they didn´t sell in the evening and we sell it the next day for half price. And we give a small revenue share back to the bakeries, so they are kind of happy to give their stuff to us for free. For consumers it´s great because they can buy the baked goods at half price. When was Aess-Bar founded? How has it evolved since then? We opened the first shop in 2013, so it´s more than three years, almost four years now. But it took us like a year from the idea to actually get to the first shop. So, the idea is a bit longer but it opened in November 2013. At the moment, this is the first shop, and then after that, every year we opened two more shops. So now we are six shops and two are in planning. What were the main steps in the decision-making process to build a company that aims at reducing food waste at the retail level? The idea was actually to reduce food waste, so we did some research where food waste is happening and we found out that the most is actually happening at home, almost 50% of the food. The question is how to reduce that. And our idea was, if we can increase awareness on how valuable food is and that you can keep it longer than you think then that helps kind of make people rethink how they treat food. And the way we do that is by actually selling bread, which usually you just keep one day, to show the people that is actually still valid, still high-quality, still very tasty and really good. And we hope that if they buy it at our shops they kind of maybe think in different ways at home. We always wanted to have a business that doesn´t rely on donations or sponsorships or stuff like that. We wanted to have a business that is self-sustainable, so people pay for the food and from the money we get we pay the salaries and the rent and so on. So we kind of always wanted to make a business. It´s not a profit business, so we don´t actually earn money as an owner-investor but it´s self-sustainable so we can pay salaries and rent. Did any of you have previous backgrounds in social entrepreneurship and/or in food waste? We are four friends and we have three or four startups at the moment. This is the first one that we do it B2C (Catering to end-consumers). We always liked to build businesses, we did something in renewable energy and idea creation, so always something in the corporate social responsability space. This is the first in the food area as such. We are kind of good in building businesses but we have no idea about the techniques about food waste. So we have a friend, she is a trained baker, and she helped us build up actually the shop from a technical point of view. So we are more the funds, marketing, business, financial guys. And we all have jobs on our sides, so we have to actually earn our own money and as a hobby we have Aess-Bar. But the people we hired to actually sell the goods are trained experts. How do you see Aess-Bar expanding in the next few years? We already have in five different cities, we already have shops. And, of course, you want to have in all big cities in Switzerland. There are only like four, five big ones that are kind of big enough to have an Aess-Bar because you need a lot of people, it is high-volume business, and you need a lot of bakeries that have leftovers so you can aggregate it to have a big enough pile that you can actually sell. But you can think of internationalisation, have different branches like catering, stuff like that, can branch out to different dimensions. Or instead of having like baked goods, why not vegetables or cosmetics or something else that could be reused. 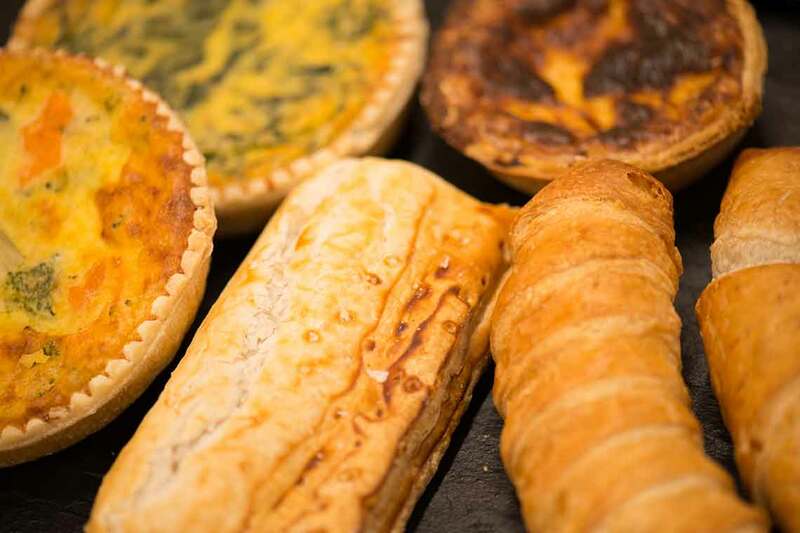 Fresh, high-quality baked goods are photographed at one of Aess-Bars bakeries. Source: Aess-Bar. What products do you sell in your bakeries? Everything that the bakery sells we kind of resell here. So it´s sweet and salty stuff. Sandwiches, over lunch time everyone buys sandwiches or pizza or stuff like that. In the evenings and mornings it´s more like the sweet stuff, cakes, pastries and so on. We also have bread, there is a lot of people that buy bread. We tried to experiment with different stuff over lunch, like soups or hot dogs or baked potatoes but that kind of doesn´t work so you have to stick to the brand, you are a bakery and they expect you to sell stuff that´s in a bakery. We have salads, because the bakeries sell salads, but they are kind of just a small addition to our portfolio. How does the logistics part work? Do they bring the products or do you have to collect them? No, we have to collect them. The bakeries like our idea if they don´t have any additional costs or work. So you have to collect them, you have to give them your refrigerators in case they don´t have one to store it for you, you have to give them the cases, everything. You have to bring it back, you have to clean, and then they do it. Because also they get money on the side. It´s too much work, they´d rather throw it away because bakeries are a small, narrow-margin business, so they can´t afford to have additional work. We have seven buses going around at the moment plus the food truck. So kind of big logistics, because we have different routes, different opening hours. What happens to the food products that you don´t sell by the end of the day? Every evening we have to clean everything, we have to throw everything away, although it´s still valid. We give it to animals, like the bread, but we are not allowed to resell it to humans. We could give it away for free, but then the bakeries don´t want us to give it away for free. So we have three different types: we have general waste, the bread and stuff you can leave to animals and anything that contains animal products, like eggs or milk, we are not allowed to give to animals so we have to make natural gas out of it – we collect it, bring it to the facility and they make gas out of it. You could eat it but you are not allowed to sell it anymore. And legally, you have to separate this food from the food you are still allowed to sell, although it´s kind of the same food. People shop at one of Aess-Bar´s food trucks. Source: Aess-Bar. When it comes to pricing, how have you decided to price items? We have different principles. We want to resell it at half the original price, but then we want to make it simple: all pastries are the same price, everything is two francs, the big ones are maybe three francs and the small ones are one franc. So depending on the origin we don´t have different pricing, so if you have a cupcake, it´s a cupcake, it´s two francs, independent of what the original price was. And then we always round to even figures, so we don´t have to deal with the coins, it´s easy to calculate and it´s easy for the consumer. We don´t need calculators or like check-out system, we don´t accept credit cards. Over lunch it´s really crowded, so you have to be really fast, you don´t have to count coins. How do you start a collaboration with the bakeries? Do you get in touch with them or do they contact you? At the beginning it was us who kind of convinced them. Now we built up kind of a brand that´s already known to most of them. So now and then we have bakeries approaching us because most of them have to pay to get rid of the leftovers, the surplus they have, to throw it away, and we give them money and we collect it, so for them it´s easy. But most of them don´t do it because of the money but because they themselves do not like to throw away food, because they invest a lot of time and money to produce it. And now they can make marketing and PR out of it, we have flyers at their shops and they can say they treat the food responsibly, they don´t throw the food away, they give it to us in case there is any leftovers. They often try to have half price at their own shops but that doesn´t work because then the consumers just buy the cheaper stuff, so it kind of destroy their margins. So they would rather give it away to us, get some money back and have the rest at the original price. Have you ever been approached by other bakeries that considered your company unfair competition as a result of your prices? The only thing with baked goods is that it´s a very local market. So people don´t want to walk half a mile just to your place to get bread, especially if it is just half-priced bread. So if you collect it from different towns, they [bakeries] don´t feel any different. Even bakeries that are like two hundred metres away from here give us the food because they say it´s a different segment, different people. They don´t feel like coming down because we opened a shop here. I think it´s maybe more the large retailers that have kind of been impacted. But they are so big, they don´t see any difference. Actually also the big ones approached us if they could resell stuff at our outlets, which we don´t do because we don´t want to mix baked goods with big retailer goods, because of different quality, different volumes and stuff. What type of customers do visit Aess-Bar bakeries? Are they more motivated by the price or by the social/environmental action? There was a study, I think it was two years ago, that the Bundesamt (Federal office) made on consumer behaviour and they found four different types of behaviour: One is more money or cost conscious, another one is more ethical, another one is more convenient and another one is more impulsive. We interviewed people coming out of our shop in Zurich and we found out that the people buying at our place perfectly match those four. Statistically, everyone is coming to us, so it´s not just the environmentally-conscious people or the ones who like cheap food but the mix we found or the way we sell stuff at our outlets attract all four different ones. The ones who are just hungry, maybe the tourists, but we have also students that come to our place because they like the idea, road workers that want to buy a cheap lunch and come to our place. Employees pose for a photograph at one of Aess-Bar´s bakeries. Source: Aess-Bar. Do you think that your customers acquire a certain level of awareness about food waste after leaving your bakery? Yes, I think so. We have, of course, some people like regulars that come now and then because they live or work in the area. Many people come to our shop because maybe they are tourists or maybe they are visiting or want to see the shop. But most people don´t just buy stuff, they always have a little story to tell or ask questions. If you have a look at those customer books at the entrance where you can write the signature, every day several pages are filled. People like to interact, they are very aware of what they are doing and also we are very open, our site outside says “fresh from yesterday”. Everyone knows: “if I go in here it´s something different”. So, I am pretty sure, I don´t know if they change the behaviour, it´s something we hope, but I am pretty sure that they know exactly that they do something good for the food. And the second thing is we have a very high media coverage, we have been to all major stations, newspapers, radio stations and so on, so we kind of think that because of us the topic of food waste is more prominent or visible in the entire swiss population. How likely do you think it is for customers to transform their food treatment habits at home after their purchasing experience at Aess-Bar? We hope. What we know is that we raise awareness. So this is always the first step, to know that there is a problem. If you don´t know there is a problema, you are not going to change. To know there is a problem doesn´t necessarily mean you are going to change your behaviour. We don´t know. But at least the first step we kind of think we have a small part in it. There are more than two million tonnes a year that are being wasted according to the study you just mentioned. We sell 500 hundred tons a year, which is nothing compared to two million tons. So, directly on the impact of food waste, but indirectly because people talk about it, they are more aware and we hope to have a small impact. Do you collaborate with other civil society organisations, businesses or government agencies in Switzerland? I think the biggest part in bringing those actors together is done by foodwaste.ch or United Against Waste and those big organisations that are more like associations that kind of combine those startups to develop their ideas and so on. It is found to be very tough for most of the ideas to actually be scalable or survive on the market because of its low margins. It is mostly about people that are very engaged. But as soon as the people quit, the idea kind of collapses. Whereas Aess-Bar is self-sustainable, so if we the founders do something different, the shop will still continue, it will still get revenue. We are trying to find, so we are supporting other startups to become a business, but in the operations we don´t collaborate with them together. We resell products in Bern or here from other companies but it´s just one outlet so it´s symbolic, it doesn´t really help their business too much. So it´s more knowledge that we spread, not like operation and collaboration. What an excellent idea! So resourceful. I really enjoyed eating my ‘Frisch von gestern’ Danish pastry with my in-flight cup of coffee on my morning Ryanair flight from Basle to Dublin. The best ‘Elevenses’ I’ve had in a long time!